Ice cream cake sounds good to eat in August, but it’s not as fun to make this time of year. 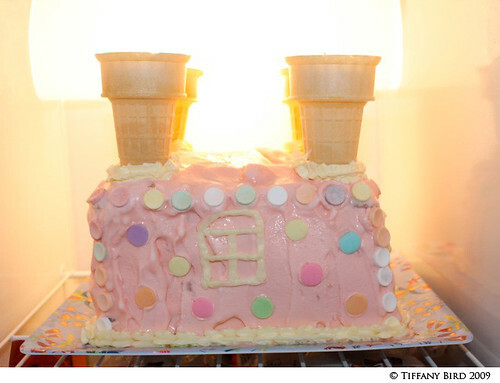 But here it is, a simple ice cream cake tutorial. 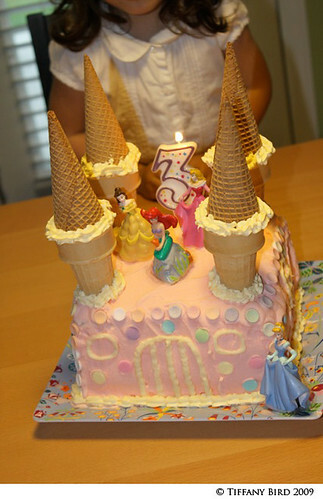 This was for Kaye’s 3rd birthday as she requested a pink castle cake with princesses on it. Luckily, my amazing friend, Julia, found Disney Princess cake toppers at the grocery store on clearance. She gave them to me, wouldn’t even let me pay her for it. What a dear friend. I’m not a cake decorator by any means. So you’ll have to excuse my design. This is mainly a tutorial about how to make a layered ice cream cake. It’s easy, but time consuming because of the freezing and refreezing time. If you make something using this tutorial, please upload pictures of it in our Flickr group to show it off to everyone. You may be featured on Simply Modern Mom. 1. Make a cake. 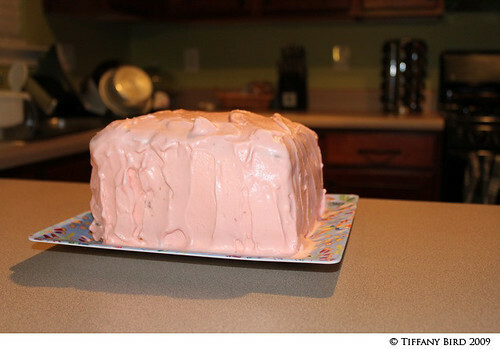 In my case, I used a boxed cake mix. Quick and easy. I divided the batter into two 8×8″ pans and baked as directed on the box. 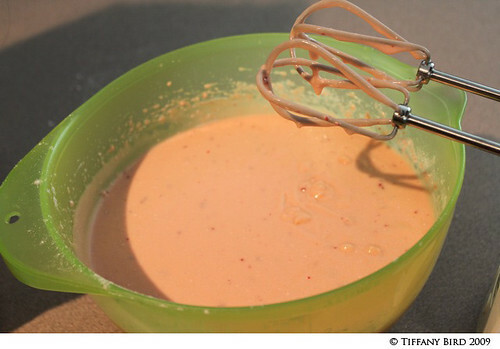 Make sure to grease and flour the pan before pouring in the batter. I had my assistant who came with her own equipment. 2. After baking, allow cake to completely cool. Remove from pans and wrap each layer in wax paper. 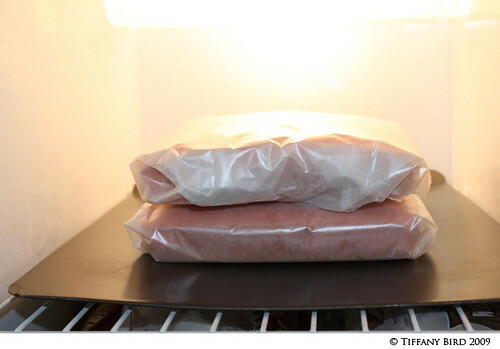 Freeze the layers for at least 2-3 hours. It makes it easier to trim the cake and insert the ice cream layer. 3. For a delicious frosting, I prefer vanilla ice cream. After you freeze the cake, prepare the frosting. 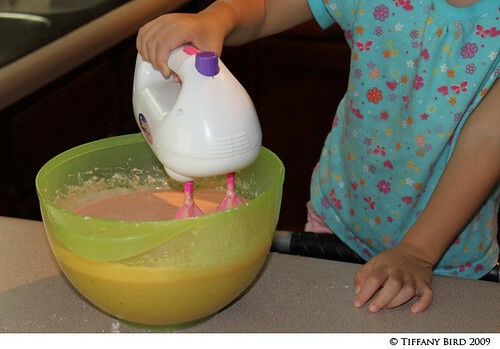 Scoop the ice cream into a mixing bowl and mix with a mixer until ice cream is a frosting consistency. Careful not to mix too much where the ice cream turns soupy. 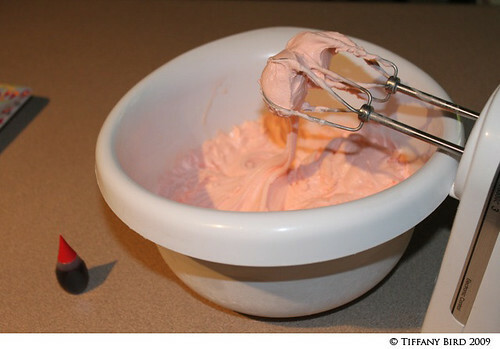 In this instance, I put red food coloring in the ice cream to make it pink. 4. Trim the cake layers so both tops are flat. 5. Take your boxed ice cream and rip off the box. Cut slices of ice cream to lay on top of bottom layer of cake. My ice cream layer is usually about 1 1/2″. I like a lot of ice cream to balance out the two layers of cake. 6. Frost the cake with the ice cream frosting you made in step 3. Use it to fill in the discrepancy in the layers. Do it quickly as the ice cream will melt (especially in the summer). Refreeze the cake overnight (about 8 hours). You don’t need to cover it with anything. 7. Sketch the designs with a toothpick. 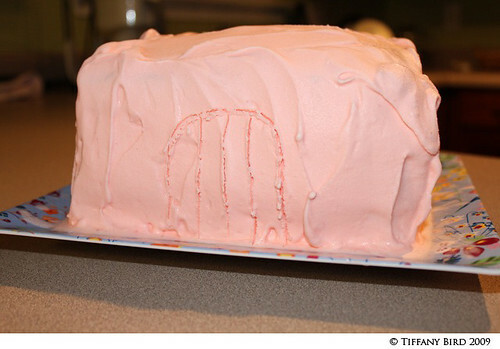 Then trace over with frosting. 8. Decorate cake as desired. Refreeze until ready to serve. This cake serves 16 since it’s so tall. Tastes best the first couple days of making the cake. This cake doesn’t keep longer than 3-4 days. Hi there! I had to click on this link because PARTIES are on my mind! I just did a post on a Spy Party I did. This cake is AMAZING!! It turned out so well. Your little girl must be on cloud9. Excellent tutorial too. What a super special girl’s cake. What a cute idea!! I’ll have to keep this in mind for my daughter’s May birthday. Yeah, and it’s cake and ice cream all in one. Adorable!!!! Just perfect and screams “little girl” all over it. I know my little girl will love it too. Another idea I am tucking away until her birthday in Nov.